The news headlines in Israel recently have been dominated by controversy and political turmoil over the so called “Tal Law”. It has threatened to break up Netanyahu’s ruling coalition, brought in the left-wing Kadima under the less-than intelligent leadership of Shaul Mofaz, and looms over the country threatening to trigger early elections. This is unfortunate due to the very critical issues Israel is facing such as Iran, terrorism, missile barrages on its southern cities, economy burdened by socialism etc, but it is serving as a scapegoat for all of Israel’s ills and diverting our attention from our true enemies and forcing us to squabble with each other. The political wrangling has been complex and anything but elegant. Kadima had remained head of the opposition under Tzipi Livni. Mofaz had claimed repeatedly that he would never under any circumstance join the government under Benjamin Netanyahu and criticized it in violent and insulting terms (including calling Bibi [Netanyahu] a liar). Soon after taking over the leadership of the opposition Kadima party, he changed his mind and readily joined the coalition. Mofaz has flip-flopped a record number of times on many issues in his short reign over Kadima. This is not surprising since his very membership in Kadima itself came from an about-face. In his final years in office Ariel Sharon broke from the Likud that he had helped to found and grow, in order to form a party (Kadima) from the left-wing factions of the Likud who would follow him as well as from more moderate members of the left wing parties who would defect “to the center”. He did so in order to establish a new leftist party that would support him in his unfortunate destruction of Gush Katif and its surrender to Hamas in Gaza. As the move was unpopular in the Likud (especially after the more left wing leaning members had left to the newly established Kadima party under Sharon), Shaul Mofaz as the leading “General” left in the Likud (He had served as IDF Chief of Staff, and Minister of Defence) thought that he would be able to keep the Likud all to himself. Mofaz consistently made statements of how he would never abandon the Likud and spoke against the “Disengagement” and withdrawal from the Jewish Gush Katif. He maintained this position, even as Sharon personally invited him to the new party and offered him an important position there. Mofaz however was quickly sidelined by far more intelligent figures including Bibi who took over the Likud leadership. Not happy to remain an underling in the Likud, he quickly did his typical flip-flop and ran to Kadima, now in a much less prestigious and uninvited way. Years later, as Kadima lost all personalities of any prestige whatsoever (Sharon is in a coma, Shimon Peres is now an elder statesman and the (non-political) President of Israel, Ehud Olmert and his entire administration were booted and condemned by their embarrassment handling of the Second Lebanon War and their corruption), Mofaz was able to narrowly defeat his female rival, Tzipi Livni, as leader of Kadima. Shaul Mofaz now still reigned over the largest single party in the Israeli Knesset (parliament), but this was a leftover from an era completely erased from memory now. It is the result of an election still heavily influenced by faith in the larger than life Ariel Sharon. This Knesset was elected in the beginning of 2009. An election now I believe would almost completely wipe out Kadima and put it on its deathbed. Leftists and rightists both are returning to their traditional parties, Kadima holds very vague ideas of what it even stands for. It was based solely on the personality of Ariel Sharon who led it briefly, and as time passes, people increasingly remember him for his decades of Hawkishness, and membership of the Likud, rather than his last frail and sickly couple of years with Kadima. Sharon’s successor, Olmert sealed Kadima’s fate by presiding what is probably the most disastrous and incompetent Israeli administration in history. Shaul Mofaz, knowing this, wanted to prevent elections (where his Kadima party would largely fade), and join the government as an important minister. Though Netanyahu did not fear elections, since his government is by and large popular, wanted the stability that adding the large bloc of Kadima parliament members would contribute to his coalition. It would deprive any one or more of the small parties in his ruling coalition of the “blackmail” power they have thus held so far (since Netanyahu has had a a small majority coalition thus far, any party can threaten to get its way or bolt from the coalition and triggering a collapse of the government). The common knowledge in Israel was that Mofaz got “played” by Bibi. It was Mofaz who looked like a power hungry flip-flopper content to be made a minister and afraid of elections. Meanwhile, Netanyahu looked like a sober leader, willing to work with any party who comes to the table, and a politically savy Prime Minister that added stability to his government. Though this may be true, I believe it was a mistake on the part of Netanyahu. It was the easier choice and the safer choice, but more boldness would have had Bibi hold out for an election, willing to stand by his record and principles, not afraid of it and not willing to pander power over to his opportunistic opponents. Though there was more risk in this course of action, Netanyahu would likely have seen himself with true stability, meaning the sitting at the head of a much larger Likud-led government and most importantly, a drastically decimated Kadima. Joining them to the government, breathes new life into both Shaul Mofaz and Kadima who now once again will dominate Headlines and policy. This will no doubt put them in a stronger position in the next elections and ensures them more years of life. Netanyahu would have done his country, himself and his party a great favor, by speeding up Kadima’s demise into oblivion. In any event, the supposed stable large ruling coalition is now in big trouble due to disagreement about the so called “Tal Law”. Various parties have threatened to quit the coalition over this law (if it is renewed or not renewed). Mofaz, who cited working on a new bill to replace the Tal Law as a major issue of why he was joining the coalition (which he earlier promised he would never do) has now threatened to leave the coalition over it. The law, and the controversy surrounding it all have to do with the status of Orthodox (or as often referred to, ultra-Orthodox) men vis-a-vi the universal draft and compulsory military service in Israel. Common knowledge among the Israeli public is that haredi (“Ultra-Orthodox”) men are exempt from military service in a nation where it is otherwise compulsory. This is not entirely correct, as we shall see. It also tends to infuriate large parts of the Israeli population, and is often used as a scapegoat for the entire nation’s problems. If average Israelis vented just a fraction of their anger against haredis towards our enemies, our problems here would be long taken care of. 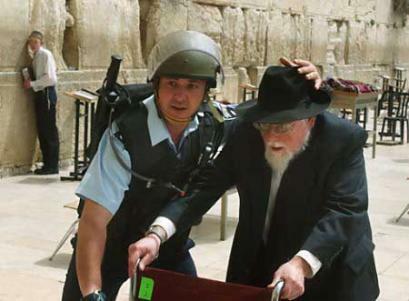 An Elderly Orthodox Jewish man under attack from stone throwing Arabs above at the Temple Mount, being helped by an Israeli Police officer. Firstly, prior to the Tal Law passed in 2002, there was NO law granting Haredi men any exemption of any kind. There was however, a ministerial (Ministry of Defense) tradition of granting Yeshiva students (and not simply Hardei men) deferments from the draft as long as they were full time Torah scholars and met other conditions. They can then in time obtain parental or age exemptions available to all. This goes back to the days of tha nation’s first Prime Minister, Ben Gurion. He felt that armed Jewish forces dragging away very religious Jewish men off to conditions where they could not keep all their laws, and not study Torah was not the right beginning for the Jewish state. It must also be noted that (just like in the US during its draft years) Israel also allows deferments for completely secular University students, pacifists, marriage and parenthood, and other reasons. Not much uproar is ever heard about that. In the early days of the state, there was also an understanding that while young Jewish men ensure the state’s political survival, it is the Torah scholars that ensure the Jewish people’s survival beyond any one political state (Israel has risen and been conquered many times before, it is Judaism as opposed to any one Jewish government that lives on defying the Historical odds of longevity). Secondly, military service is not entirely compulsory and universal under the actual Law. Minorities such as Christians, Muslims, Samaritans, Arabs and Bedouins (in any combination) are actually EXEMPT (as opposed to deferred) from military service, though they can and often do volunteer. In fact, besides Jewish men and women (men are required to serve 3 years and often in combat units, while women are drafted for 2 years), only the Druze and the Circassians are also under compulsory military service under the law since the early days of the state. The Druze have an exemption for religious members as well. The Druze were included in the compulsory draft at their behest, and to this day we are proud to serve along with them in the IDF (just as your humble author was when he had the privilege to do so). Therefore, since the law is anything but “universal” cries of the haredi deferment specifically being undemocratic, unjust and unequal are not grounded, but rather political in nature. 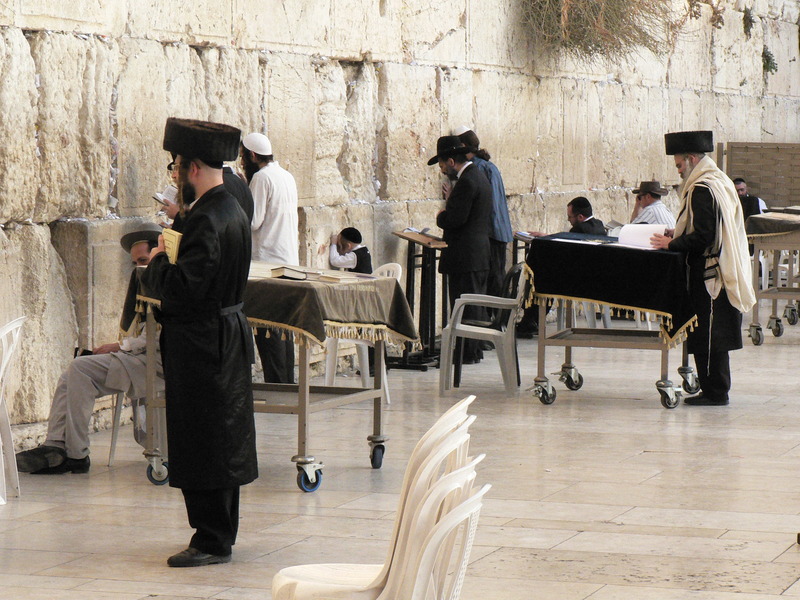 Haredi Jews Praying at the Western or Wailing Wall in Jerusalem. During the late 90’s the status quo was challenged by the left and the courts, and this led to the appointment of the Tal committee by PM Ehud Barak. The comite, headed by former Supreme Court Justice Tzvi Tal, and later by Yohanan Plesnar, existed since 1999 until its recent resolution by PM Benjamin Netanyahu in July 2012 (which caused a political firestorm). Based on the early findings of the comite, the so called Tal Law was passed in 2002. Though the political wind behind the committee was to in effect end hardei exemptions from military service, it actually codified them into law for the first time. They may continue to study and be exempted. The Tal Law not only for the first time codified into law what before that was simply ministerial orders or customs, but also more crucially for the first time allowed haredis as a group to be exempted from military service as opposed to only Yeshiva students (much like College students). In the decision age of 22, the Yeshiva student can chose to perform 1 year of National Service and work at the same time (for a salary of course), instead of Yeshiva study, and consider his duties completed whereas any other Jewish man must have completed 3 years of military service. The Tal Law was thus never popular in either political camp and was finally struck down as unconstitutional by the courts. The Tal Law however, was designed as a temporary measure that must be renewed every 5 years, and so the courts decided to let it wind down on its own since it expires this year. Netanyahu has said he would draft a more appropriate bill, but is reeling from his coalition being torn by different sides over the issue with parties threatening to bolt. Israeli society at large and certainly the news media continuously speak of the ticking “time bomb” the Yeshiva student exemptions are. They argue that the country cannot sustain these exemptions, militarily and economically. The haredi birth rate is of course higher (as is the Muslim and Arab one) than the average Israeli rate, and so the number of exempted Yeshiva students has grown. But do the numbers warrant the panic? Firstly, let us put the Orthodox in context. Fully observant Jews, Orthodox by any standard that would be used in the Diaspora, bearded and Yarmulke donning, compose an ever-increasing percentage of the IDF’s manpower. This is especially true when it comes to the combat units and officers’ ranks. Twenty years ago, their percentage of each year’s officer class was about 3%. Today, the figure stands at a whopping 40%. One need only look around any typical IDF combat unit to see a very large percentage of the young soldiers wearing Kippahs (yarmulke), and to find the best of the soldiers and officers among them. The percentage often increases drastically in the most elite combat units. As one retreats further back into the rear, it is in the purely administrative and logistics bases (where “jobniks” as they are known in Hebrew slang) serve. This is where one begins to see a greater number of secular Israelis and the number of beards, payes and tzitzit diminish. Where secular Kibbutznik Jews once famously dominated the ranks among the IDF’s best combat units, today, whether it is in regular army service, elite combat units, or especially designed Hesder units (that combine army service and Torah study), fully Orthodox Jews are an ever-growing part of the IDF’s core manpower and outstanding leadership officer class. On the other hand, there IS an inconspicuously absent sector of the Israeli society in the IDF, especially among its combat units; the sector of course is the very same one crying out the loudest to ship off Yeshiva students in chains to jail for refusing to forsake many of their religious beliefs and serve in the IDF. The sector of course is the same one that is behind many of Israel’s plights, the secular leftist Tel-Aviv la-la-la land crowd. While mostly well off and “pretending” to be socialists to quench their economic feelings of guilt, this growing effeminate crowd of vegetarians and pacifists easily sidesteps military service. Deferrals, doctors’ notes, family excuses, University, psychological “traumas”, they find it easy enough to avoid the compulsory military service that they demand so harshly be enforced upon Yeshiva students, and the IDF is all too happy let them do so; of little use would they be in any event. The “cream of the crop” of this population, which actually at least enlists in the IDF, most often enjoys high standards of service and light duty (comfortable new bases, private food caterers and “work” hours ending at 5 while sleeping at home nightly) which would make your average combat soldier die of shock if he but knew of their existence. These “jobniks” as they are called either do pretty much nothing except join the bloated ranks of the IDF non-combat units which are often little more than state-run day care centers for 18-21 year olds, or get a top notch job training education at taxpayer’s expense while serving in non-combat technical, engineering, intelligence or communication units. Not to misunderstand, many non combat positions are of critical importance in any army (which in the IDF are actually mostly performed in outstanding fashion by girls). These jobs include course instructors, intelligence officers, high-tech R&D, communications, encryption, logistics and so forth. However, the ethos of the State of Israel since its founding (and even in pre-Statehood in the various underground defense organizations) has been that every young man must strive to be a combat soldier, since it is there that he risks the most, and gives the most. Since only the most physically and mentally fit can be combat soldiers, those who by constitution are unable to can honorably fill the other essential non combat positions. Finally, there is of course a small percentage of people, who though perhaps fit to be combat soldiers, excel so greatly in a specific field or are otherwise brilliant enough, that the IDF may ask them to contribute in other ways (cyber warfare, engineering, biotechnology, etc) since in that capacity they would benefit their country far more than they ever could by being one more soldier with an M16. That is all well and good, and this was long the state of affairs in Israel, there was never enough combat soldiers, as Israel was surrounded by a hostile Muslim world that dwarfed its population and was bent on destroying her, and only those who could not serve as combat soldiers (women and physiologically unqualified men) would fill the military’s administrative and logistical arms. However, intentionally ducking this duty by the able-bodied, was until recently seen as showing poor character and socially unacceptable. High school girls often thought a boyfriend who isn’t in a combat unit is worse than no boyfriend at all. Today, in much of central Israel, this situation has completely been reversed, where combat soldiers perform much of their 3 years of service date-less as they are seen as “suckers” who live in poor conditions and rarely get to go home. The “jobnik” is the wise guy who is home daily and has time for plenty of romance. Most combat battalion and brigade level commanders can tell you how few if any of the soldiers that serve under them are from Tel-Aviv, Israel’s metropolitan and economic center (Israel’s New York and LA). In addition, most of the few that are, live in Tel-Aviv’s southern areas, not the northern more affluent (and left wing) areas. In the Lighthouse Keeper’s own experience, his company’s soldiers hailed from every nook and cranny imaginable in Israel, small cities, towns, Kibbutzim, Judea and Samaria, and quite a few of course were from Israel’s other large cities: Haifa, Beer Sheba and especially of course, Jerusalem. Not one soldier however was from Tel-Aviv or its affluent northern suburbs. In fact, it is hard to recall any soldier from the entire battalion living there. Statistically of course, this is shocking since Tel-Aviv is Israel’s population, commercial, political and financial heartland. The Tel-Aviv metropolitan area is Israel’s largest, and the city itself within its strict legal boundaries is Israel’s second largest next to Jerusalem (Jerusalem is not as subdivided into separate municipal entities as the Tel-Aviv metro area is). Having said so, once you account for demographics, these numbers are even more shocking. Firstly, Tel-Aviv is (at least officially) 93% Jewish and the Haredi population is insignificant compared to the large one in Jerusalem. Furthermore, Jerusalem, just like the north and the south of the country, has large Arab populations that do not serve in the army. Taking these factors into account, the rate of enlistment of non-haredi Jews in Tel-Aviv and its surroundings, compared to that of those in other parts of the country is completely shameful. Comparing the two group’s rate of enlistment in combat units in the IDF would be laughable if it was not so sad. So to put matters into some perspective, it must be understood that the entire idea of a national conscription is already largely a fallacy. The percentage of haredis living in Tel-Aviv is miniscule compared to that of Jerusalem and despite this Jerusalem’s rate of enlistment dwarfs Tel-Aviv’s whose secular citizens find a way to avoid army service, especially in combat units. This does not stop them from constituting the base of the movement to draft haredis by force into the army. They often protest, sometimes violently for that cause as they did when the law was struck down. Socioeconomic parameters do not explain the difference. Largely secular Middle Class to Upper Class towns such as Maccabim-Reut and Modi’in excel in conscription rates, especially in combat/fighter units and officer course graduation rates. The reality is so stark that currently only 3 residents out of the nearly half a million residents of Tel-Aviv serve as company commanders while a community such as Bruchin with fewer than 600 residents, is home to six company commanders! The Personnel Directorate of the IDF maintains statistics on the potential manpower base of the nation and all sorts of demographic statistics that the IDF can draw upon. In their draft ranking of Israeli cities, the Directorate scores Tel-Aviv as 53rd! To put this in perspective, even a completely Arab city (not known for its pro-Israeli sympathies, and actually often quite dangerous) such as Rahat tops Jewish Tel-Aviv in the list (due to young Bedouin volunteers)! Furthermore, anyone that knows Israel knows it is a very difficult task indeed to even think of the names of the 52 cities in the small country topping Tel-Aviv in the list… it’s virtually all of them. The Numbers themselves are pretty shocking, but the reality is far worse. As low as the conscription rate is for secular Tel-Aviv and it’s surroundings, it is only a fraction of the story due to the fact the conscription rates themselves cannot be compared. All service is not equal. The reality can be seen in enlistment rates of combat soldiers or fighters, the true shield of Israel that daily saves the nation from an Arab onslaught that would destroy it. Though many of the secular leftist youths, concentrated in Tel-Aviv but present throughout the state, are able to avoid military service altogether, a great many of them still do serve in some fashion. This is what in large part hides the magnitude of the problem and allows the spotlight to directed at haredis. 27.7% of the total pool of available male draftees were exempted. This is nearly a third of the entire population. Of these, about two thirds were NOT due to religious reasons. 11.2% were due to Yeshiva Studies. So even when it comes to comparing flat conscription rates, we see that nearly two thirds of the problem is not haredi exemption. But when we look deeper we realize the reality is quite the contrary. The significant percent of young secular men (especially from Tel-Aviv and its environs) that do “serve” most often do so in little more than symbolic fashion. The IDF has not made public more specific data, but enough was already presented above. The combat soldiers and officers are made up of an ever growing proportion of fully religious soldiers. It was also pointed out the Tel-Avivians are almost completely absent from combat units and the ranks of the field commanders. So basically, it is the orthodox Jews who are actually defending Israel’s existence by force of arms, and it is the secular Jews (who are increasingly completely absent from this task) who are screaming and outraged at the minority of orthodox Jews who are not serving. In countries where the military forces are an all-volunteer and professional force (such as the US), the armed forces at least in theory do not employ anyone they do not need. Every position is filled by a man or woman who must be given a full salary, benefits and the wide range of incentives offered to people who chose to enlist (the army in essence competes as an employer with every other private company in the country). In such a system, the vast majority of Israel’s “jobniks” would not have a job. In Israel, because military service is compulsory, the army must take or does its best to take everyone. It is seen not only as the institute that defends Israel from destruction, but as a formative educational institution of the country that binds all the citizens together. It is also a great equalizer for civic privilege and responsibility. Rich and poor, Ashkenazi and Sephardi, left wing or right wing, the idea is that all share the foxhole and end up sharing an unbreakable bond. This was certainly true in earlier days of the state (when Yeshiva students were still exempt) but unfortunately much less so today due to the great disparities in service. In any event, the compulsory nature of the military service and the wish to serve as a societal tool besides a defence force for the country, makes the IDF enlist thousands and thousands of young men and women who have little to offer the service and even less desire to be there. Discipline, the cornerstone of any military is completely absent among these conscripts. National service pays only a symbolic rate, and these young people are compelled to serve by law, so in what possible way could they be disciplined? As a country with normal Western values, Israel does not flog or in any way physically punish these unruly lots, and has absolutely nothing to threaten these young “soldiers” with. Will they be expelled from the unit and the army?? They certainly would hope so! Serve time in military jail?? The military jails in Israel differ little from regular bases, both are places where you’d rather not be and are not allowed to leave most of the time. The difference is that in the military prison you are fed and can rest the entire time, whereas in the regular base you have certain chores and responsibilities to do. They only slight deterrence against jail time in the IDF for non motivated conscripts, is that technically, the “pasam” (the “clock” on your 3 years of service) technically does not “tick” while you are in jail so you get no closer to finishing your 3 years. However, everyone knows that in practice, if you truly refuse to cooperate you will quickly be thrown out of the jail and the army completely. The IDF cannot handle the large mass of unmotivated conscripts and exists in an uneasy truce with them. As long as the service is easy enough, the conscripts will more or less listen to orders when it suits them, and everyone can pretend that the national draft exists. The threat of imprisoning the conscripts is more a threat on the system than on the individual soldiers, Israel cannot logistically handle the mass arrest of so many jobnik soldiers who on a daily basis refuse orders. Nor will it keep them there indefinitely since the “pasam” is technically not ticking. The IDF has 12 male jobnik soldiers for every one combat soldier. On top of that of course, there are virtually all the young women who serve who also classify as “jobniks” (though as was mentioned earlier, the motivated ones tend to take on the most important non combat roles in the IDF since motivated male soldiers would tend to be IN combat roles). It has become a bloated, bureaucratic, day care center for children rather than an army. The other kids are mean to him, the food is not acceptable, my son is not getting enough sleep, etc etc. Frankly, this serves little good, for the youngsters who spend 3 years in this environment instead of University or working (or playing), and for the army that must take care of them and engage in a constant battle with them to maintain basic control. The “real” army meanwhile, might as well be another world. Getting through combat training in any unit in the IDF, even basic infantry battalions, is very difficult. These young men are tested emotionally, mentally and physically day in and day out. Therefore, any cadet who finishes the course and becomes a fighter and member of the unit very much wants to be there. No one can endure 3 years of a fighter’s field unit service if they do not wish to be there. It is easy enough to get thrown out, and hard enough to stay in even if you very much want to! And so, combat soldiers, unlike jobniks are easily controlled because of their patriotic wish to serve their country and remain part of their unit and among their comrades. As opposed to the daily refusal of orders that happens in the non combat parallel world of the IDF, in a combat unit it is virtually unheard of. A soldier who is not disciplined will not only potentially be sent to jail but more importantly get thrown out of the unit. These outstanding young men receive little respect for their sacrifice and giant efforts, especially those who do not go on to become officers or are not in elite units. While tourists marble at and pose in pictures with the young uniformed Israeli men that can be seen everywhere in Israel’s streets (jobniks), the combat soldier toils away at the front line with little sleep or pay and remains unheard and unseen. In fact, in one of the ironies that our world is filled with (and I am always too happy to point out), the mass of jobnik soldiers that is supposed to support the fighting troops actually immensely hurts the combat IDF soldier and his performance. All armies have large forces of “jobniks”, the logistical, communication, technical, medical and administrative units that allow the combat soldier to perform his duties. From the chef that cooks his meals, to the driver that brings him truckloads of ammunition, they are critical. However, it is difficult to give “critical” jobs to people you barely have control over and don’t want to perform them. Despite the fact that there are 12 male jobniks for every male combat soldier in the IDF (who Israel gets to draft, and not hire at full salary like other countries which one would think is an advantage), in the IDF, fully graduated combat soldiers (fighters as they are known in Hebrew) spend unbelievable amounts of time performing house cleaning duties: dish washing, cooking, cleaning and general labor. Sometimes necessary work and often for the sole amusement of a jobnik in command. Often the jobnik assigned to the kitchen, supply depot, or whatever else it may be is placed “in command” of several combat soldiers for the day as his personal team of manual labor. The non combat 18-year-old soldier who in any other army would be the one washing the dishes, is in the IDF the commander of fighters instructing them on how to wash the dishes. Not only is this incredibly inefficient, dumb and dangerous (as it takes away vast amount of time from soldiers who should be either training for or performing their combat duties) but also is demeaning and disrespectful to the young fighters; no doubt contributing to the ever decreasing percent of young Israelis who wish to serve as fighters. There are bases in the IDF where non combat unit women, and combat unit men must perform the entire base’s kitchen duties but non combat (jobnik) men are excused. The reason? Simple, if you tell the male jobniks to wash the dishes, they will say “No”. So as much as the secular left whose members themselves largely do not serve in any meaningful way, would love to see media coverage of haredi men being dragged off by force to the army or jail by fellow Jewish soldiers, doing this would actually be of little help to the IDF. More accurately, it would be a great disservice to the IDF, and add an additional burden on those that do faithfully serve. Young IDF fighters are not policemen, and they do not undergo the sacrifices that they do for the little respect and recognition they get, in order to be ordered by the state to act as its “muscle” against its own civilians. They are too often (illegally as it is) called to expel Jews (who live in areas where the UN and the left do not believe Jewish people should be allowed to live in) by force; women, children, young and old. Now the left will have them attack Yeshivas with clubs to drag off the “draft dodgers”. All of course, in order to then burden the IDF with even more people who do not wish to serve. In addition, since these leftist cries come cloaked in the language of justice, democracy and equality, they often come together with the call to draft Muslim Arab citizens of Israel into the army as well. Hopefully little has to be said about this subject to know it goes beyond stupidity and into the realm of suicide. If the IDF already is burdened by vast numbers of secular Jews that do not wish to serve, and will be further burdened by large number of observant Jews that on principle believe they cannot serve, what on earth would desire they also deal with large numbers of hostile Arabs that would simply NOT serve? Only suicidal thoughts would. Firstly, little could be more absurd than forcefully drafting this population and other minorities, weather the cries of injustice and oppression from across the world, and then train and arm them. Even if it was possible to successfully draft any significant number of Arabs into the IDF without the most ruthless of measures, what could be more dangerous than training this population in combat, and giving them access to classified information and weapons. The Arab world could not be happier. Israel would have self destructed, and placed half a million spies, saboteurs, terrorists and insurgents within its own ranks AND be paying their salaries herself! The US does not have a draft, and most definitely does not draft Muslim men who compromise only a tiny percent of its population and yet only recently learned of the dangers this would entail at the FT. Hood Shooting (reported earlier here). Furthermore, the issue is as unwise as it is unethical. Israel is the Jewish State, and this is the only purpose it has in existing. The Arab population in general wishes Israel destroyed and her land under Muslim rule. Fair enough, but Israel as a Western country gives its Arab citizens full rights (including the vote) and protection under the law. Though Israel is the Jewish State, the Arabs that live within her borders are her guests and free to do so. Though Israel affords them all the privileges of citizenship, it should not ask of them all the responsibilities of citizenship. Arabs in the IDF would be being asked to fight against their own brothers, and for whom they consider an enemy. It is important that the Jewish State remain so, and the duty to protect it physically remain the duty of the Jews alone. 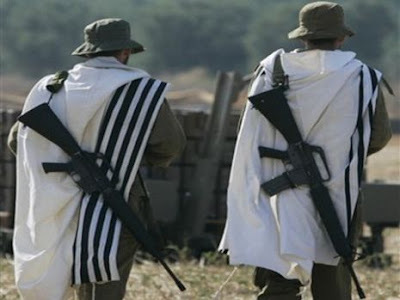 Though we welcome non-Jewish friends of Israel who wish to volunteer and bear arms along with us, they should not be forced to do so in any way. Only the small minority and special cases of the proud Druze (and Circassians), at their leader’s request and as a sign of our friendship share in the draft. The Druze however are not asked to fight their brothers, nor do they have any conflicting interests of independence (due to the nature of Druze religion). In the unlikely event that the integration of the Arab population into the army is completely successful, few things could be more disastrous for the Jewish State. Israel is threatened by the overwhelming Arab demographics around her and within her, and integration of the Arab population would quickly put an end to our 2000 year old dream of Zion. The left dreams of this because they do not believe in the notion of a Jewish state to begin with. Just “states” (if not one world state). But then, they are being too slow and dull; We don’t need a draft at all, or an army for that matter. Israel can simply surrender to her enemies, and give ruling power to the vast Arab populations around her. The conflict will then be over (after a traditional pillage and slaughter of course) and the well meaning liberal Jews can ask their new Arab masters if they can remain as full voting citizens in the new Arab state just like Israel allowed them to be while it existed. It should be noted that the main driving force behind the call to draft Arabs and Christians (all non Jews) into the IDF is Avigdor Lieberman and his Ysrael Beiteinu party backed mostly by Russian and Soviet immigrants. Though normally considered part of the right wing, often even called extremist, Ysrael Beitenu is better classified as fiercely nationalistic to a country arbitrarily called “Israel” without believing in its Jewish identity or in fact even believing in Jewish identity itself. This is due the Russian immigrant’s no non-sense approach and hawkish approach to politics (they are not yet plagued by the western New Age liberalism) but unfortunate lack of Jewish heritage due to decades of communism. In fact, most of the more recent (from the late 90s onward) Russian immigrants (and those from other former Soviet Republics) are not Jewish themselves. Knowing Lieberman, it is possible that he believes that enforcing an extremely unpopular draft among the Arabs will actually encourage them to leave Israel, but this is folly. Firstly, that could better be accomplished by instituting a tax on the Arab populations in substitute for for serving in the army, which would not carry the immediate national security dangers. More importantly, stated principals are what matter most in the life of nations, and it is those that have lasting long term consequences far beyond what any cheap stratagem can accomplish in the short term. The Jewish State has the moral right and the physical capacity to remain so, only while it shoulders the burdens of existence on the Jewish people’s shoulders. Back to the issue at hand, with the IDF already dealing with large numbers of unwilling conscripts, and the left screaming for more as long as they be Orthodox Jews or hostile Arabs, what is to be done? The answer, at least for the time being, is as usual, incredibly simple. Firstly, the question must be asked of Why some haredi groups do not wish to serve in the IDF. Surprisingly, hardly anyone ever asks that question. If people simply believe it is because they are lazy or cowardly, they have a naive understanding of what people with very deep beliefs are. Without getting into too much detail, the haredi groups in question have two main issues. Firstly, as it stands, service in the IDF is not 100% Kosher. Be it food, time for prayer, or observance of the Shabbat, though it is adequate for most Jews, it falls far below the strict standards of many haredis. For example, Shabbat (the sabbath) is pretty much universally ignored in the IDF since all the activity is considered necessary for national security. There is a long held Jewish tradition that a Jew may violate the Sabbath if it is to save lives. That is all well and good, but in the army one cannot help but see how lightly this is taken. The army’s jeeps, helicopters, trucks, tanks, and patrols all still run on Saturdays. Fully observant Jews hop on a jeep and drive around freely (which they would normally never do) since theoretically it is to save lives… but one can see that it is a stretch. Not every single drive and activity was really completely necessary “to save lives”. Army life is filled with menial every day duties. Secondly, Torah study itself is immensely important to haredis and army service, besides forcing the young men to break a myriad of halakhic laws, does not allow them to pursue their Talmudic studies. The Yeshiva Rabbis do not ever say: “No we don’t want to”, or “We are too scared or too lazy to”. They have long held well thought out beliefs that back their position. They exist in degrees as well. IF the enemy was upon us, or the situation critical, many would be eager (much more so than their secular Tel-Aviv counterparts) to aid in combat. As they see Israel’s strength as stable enough, they figure Torah comes first. So in order to really be just about the matter at hand, their religious concerns should be addressed, and then there can be no further argument. If the religious arguments are removed, then all that is left would be “we don’t want to”, “we are lazy” or “we are scared” which are not legitimate. So for example, the number of Yeshiva Student exemptions should be limited to a smaller number for outstanding scholars (just like Olympic level athletes, brilliant musicians and University students can be exempted today), and the rest subject to the draft. However, they must be enlisted into fully Kosher units such as the existing Hesder units where Haredis today already volunteer and serve. It is simply not acceptable that the Jewish state, after 2000 years of Jewish yearning for its existence, will haul off religious Jews by force to places where they cannot keep their sacred laws. Just as Ben Gurion knew that was not proper, though completely secular though he was, it remains not proper today. This of course, is what the left would like to see on its TV screens. Having stated the very obvious solution, a straightforward and just solution to the draft issue, the question however is if it is even desirable? For anyone who is familiar with the IDF, the answer is clearly “No”. The last thing the IDF needs is to draft more people who do not wish to serve. It also is unwise to further burden it with more “nanny” responsibilities such as building fully Kosher units for more people who will not even wish to serve in them. Today’s Hesder units, it must be noted, are very successful, and the soldiers appreciate the army accommodating their strict rules, but they are made up of haredis who Volunteered and wish to be there. If Israel’s society retained the values it held in the earlier part of the state, then the universal draft would continue to be an excellent institution. 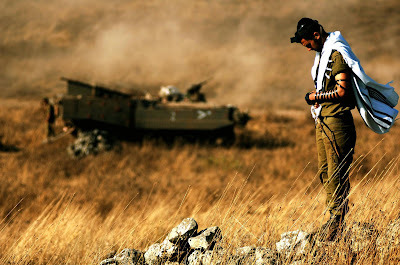 However, today it is more of a burden than it is an asset for the IDF. Also without getting into further details, it is sufficed to say in addition to what was already pointed out, that due to technological advances, the combat soldier requires an increasingly professional man. Gone are the days where the infantry man is any fit man with good patriotic character that you can hand a rifle to and rush to the front line. Complex technical skills are increasingly required and the soldier must continuously train and keep himself up to date with changes and advances. Furthermore, the Generals need to be left to do what they do best, and lead their fighting men, and not a bloated, bureaucratic, inefficient, and undisciplined national day-care center. The army must be allowed to go back to being a mean, lean efficient machine that can defeat our enemies and protect the state. Having said all that, there is much to be said about the national draft, the tradition, its leveling effect on society, the principal of shared burden, civic duty etc etc. I would be the last to condone its abolition, but we cannot be blind to the realities either. Furthermore, it is clear that a fully professional all volunteer army is not even a possible reality in Israel. Surrounded by the Muslim world and drastically outnumbered, an all volunteer force cannot have enough manpower depth to sustain the nation in time of war. The all important Reserves of the IDF (theoretically every man 18-50, though also in reality today far from that), must still be available to save the country when the enemy hordes approach the gates. By this logic, by being an all volunteer professional force, the people who wish to be combat soldiers would volunteer anyways and we can get rid of the “day care” center for the rest run by the state. The problem is that there was a premise jumped… it is not the same to be obliged to spend 3 years in a place (the army) and then volunteer to be “all you can be” while there, and to out of the blue in the luxury of free civilian life volunteer into the army. It is true, as it stands now, Israel theoretically drafts everyone, and only those who wish to become useful soldiers do so, but this number is far greater than the number it would be in an all volunteer force. The salaries the IDF would have to offer combat soldiers in order to attract such a large percentage of the population would be unsustainable. Keeping the positives of each system, and eliminating as many negatives as possible, a simple answer emerges. The National Draft must be kept in place! It is probably the most crucial law other than the Law of Return which Israel has. It is the cornerstone of Israel’s survival since 1948 to the present day. But under the current system, it is increasingly a lie and a joke. So we remove the facade. The IDF must be untethered from the State Run “day care center”. The IDF must be given first choice over the large pool of conscripts, it will once again be an honor and respect to wear the uniform. The IDF will be free to take the best of the conscript class, and ONLY those it wishes to enlist. The IDF already is a masterful and well oiled machine when it comes to this; by interviews, tests, “Gibushim” (extremely harsh days long physical and mental endurance tests), academic records and a myriad of other factors the IDF already does an excellent (though of course not perfect) job in filtering candidates and prioritizing them for different important combat and non combat units. As far as the haredis, the answer there remains simple as well… there should be as many Hesder-type units which already exist and do just fine, as the IDF requires. IF the IDF is choosing many haredis for its ranks and they are motivated to serve, the IDF itself will accommodate them. The entire aura of conflict between haredis and the state will simply melt away. It will become among them, just as it is among other religious Jews, an honor to serve in the IDF while under the conditions Israel’s chief Rabbinates deem proper and ethical. Well, the real answer is not to simply reward the unwilling or unqualified by an extra 3 years of freedom in their lives, but rather to create an entirely new and reformed National Civil Service Department. Just as the Defense Department should be unsaddled with dealing with this large mass of people, this Civil Service should be entrusted to do so. Every man must still perform his 3 years of service, whether in the IDF if accepted therein, or in the Civil Service if otherwise. This Civil Service should probably still maintain a very military “demeanor” and can in coordination with the Ministry of Defense still perhaps offer basic Infantry training (what is called “03” in the IDF) to its conscripts and perform light defense duties where the IDF or Ministry of Defense actually deems them useful. In an alternative form of this plan, this Civil Service may remain inside the Ministry of Defence but most definitely outside the IDF. The kindergarten can no long ber run by our Generals as it endangers our very survival and demeans the IDF and its young fighters. The idea behind keeping basic training in the Civil Service is to keep alive the ethos that every last man in Israel in time of need can be called to arms if need be. The Civil Service, should be able to provide labor and manpower to the IDF if it ever so requires. The conscripts in the Civil Service likewise can feel this honor and burden on their shoulders, even if largely symbolic. Besides light defense duties, the number of tasks the Civil Service may perform are limitless, as long as they are actually productive and useful. From building the cliché roads and bridges to helping in Hospitals, schools, supporting the Park Ranger Service, the Firefighters, helping disadvantaged and at-risk youth, the sky is the limit. The Service would be free to meddle in places where it is not appropriate for the military to do so. The Civil Service can even utilize its manpower pool in activities that generate revenues and profit (or at least lower the tax burden) for the state. In this way, those enlisted in the Civil Service can feel like they truly support the combat soldiers who serve in the IDF. As far as haredis in this Civil Service, the same rules should apply… as long as they are offered positions, jobs and conditions that are fully compatible with Halacha, they should be subject to this draft. Units can also incorporate Torah study. In this system, many of them would actually prefer to enlist in the Hesder combat units of the IDF since they are drafted either way. This is the key to the plan, while on the one hand keeping the draft in place and letting all citizens know they are contributing to the State, Israel could optimize and reinvigorate the IDF, cut costs, and at the same time open the possibilities of using this large pool of manpower for many positive civil purposes that no other country enjoys. This civil service, which in a much less grandiose form already exists for women who do not wish to enlist in the IDF, would of course be ideal for many young girls who do not wish to enlist in the IDF and/or who are not needed by the IDF. In essence, the 3 year draft is a tax on society that enables Israel to survive in a hostile world. However, at present, the State only receives a real benefit from a small percentage of these “taxed” but maintains the facade of everyone being taxed for the illusion of fairness. This large majority neither contributes to the State nor themselves, but rather lose their freedom for 3 long years and cost all of Israel a great deal of money that must be paid by even more taxes. It is to say the least, inefficient if not absurd. The Civil Service plan can be a way for this “3 year tax” to remain in effect equally among men of the society, but actually allow the state and the individual conscripts to derive some benefit from this tax rather than simply waste time away. Conscripts would undoubtedly benefit from real positive work they would perform, a source of learning, training, experience and personal character development. The two bodies together will also be better able to combat some of these ills by incentives that the IDF alone cannot and should not have to deal with. For example, though this 3 year tax (the draft) should be universal, reward in respect and higher pay are very important. Today, combat soldiers in the IDF receive slightly higher pay then jobniks in general, but this could be raised with the large budget savings the IDF would experience under this plan. Furthermore, the Civil Service can also offer higher pay for certain positions and to reward achievement. For example, there may be many individuals who do not have the constitution to be combat soldiers and earn higher pay and social status, but who would gladly do so in a civil environment; be it in jobs that require hard manual labor outdoors, or technical know-how in technology, or simply a caring giving nature for the sick and elderly. None of these jobs can be performed by people who are completely unwilling to do so, and so the Civil Service will have to devise a system of “sticks and carrots” to perform well. A plan of this form is what can help ensure Israel’s survival into the 21st century, a plan that maintains each citizens’ share of duty to his country, but rewards those who are willing/able to give more and removes the burden of dealing with those who do not from the shoulders of our outstanding young fighters and officers who must stand at the gates of our land and let our enemies know that as the elected ones among their people, they will not let them pass and harm the rest behind them. This of course takes vision, a real willingness to look at justice objectively across the board, boldness and is definitely much more difficult than simply wallowing in pettiness and screaming for the bearded men in black clothes to be dragged off by the hair to somewhere bad so that the ones dressed in many colors can watch it on their TV screens and be filled with a shallow sense of jealous revenge and not justice.